Good at what you do, but not quite as good at selling it? Frustrated by your sales challenges? Shorten your learning curve - and the time it takes to fill your client list - with these tips on avoiding the most common sales mistakes. Mistake Number One: You are not as comfortable as you would like to be in your role as a salesperson. If you've felt the pain of 'unsuccessful' sales calls, you've already discovered that giving the information to the prospect isn't always in your best interest unless you have "qualified" the prospect and the prospect has "pain" an emotional reason to make a change (not just an intellectual one). Respect is both a feeling and an action. Thus, we can both "feel" respect (i.e., deference, honor or esteem for someone or something), and "show" respect (i.e., by treating someone/something with honor, deference, consideration, or courtesy). While we can have respect for lots of things (e.g., other people, institutions, traditions, ourselves) ultimately it all boils down to the same bottom line - respect for "people". After all, people are the creators and sustainers of institutions, traditions, etc. and when we feel or show respect or disrespect for these creations we are respecting or disrespecting the people who support and sustain them. Respect is personal; it is person-to-person. Respect is a gift you can give to yourself and others or withhold, but when it is withheld both the giver and receiver are diminished. Miriam, as a WITI Member, submitted this article to WITI for publication. Do you have expertise to share? WITI gladly accepts submissions for publication. For more information or to make a submission, please visit the Members' Area. Kimberly Shanahan appointed client partner with Korn/Ferry International's Global Technology Market. Kimberly J. Shanahan has joined Korn/Ferry International's Northern Virginia office as a Client Partner in the Global Technology Market. Korn/Ferry (NYSE: KFY) is the premier provider of executive search, outsourced recruiting and leadership development solutions. Prior to this appointment, Ms. Shanahan was Director of Corporate Strategy and Business Development for MCI. In this role, she developed MCI's next generation wireless broadband strategy, built and managed strategic relationships and launched new wireless broadband markets across the U.S. She was recruited to MCI in 2004 to develop and lead the company's executive recruiting strategy across all functions and geographies. Prior to MCI, Ms. Shanahan spent five years with another global executive search firm, where she primarily handled Board of Director, CEO, COO and CFO assignments for technology companies in North America, Europe and Asia/Pacific. Earlier, she was a consultant with DFI International and the General Operations Marketing Manager for a large national association. "Kim brings the ideal mix of business and technology acumen to her role at Korn/Ferry," said Richard Spitz, global managing director of Korn/Ferry's Technology Market. "Our clients will no doubt benefit from her expertise and we are pleased to add her to the team." 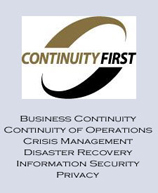 Continuity First is a consulting firm providing thought leadership for private and public sector businesses to ensure that they have the people, processes and technologies in place to achieve business resilience and mission assurance. For more information, please visit www.continuityfirst.com, or call us at (804) 559-6623.